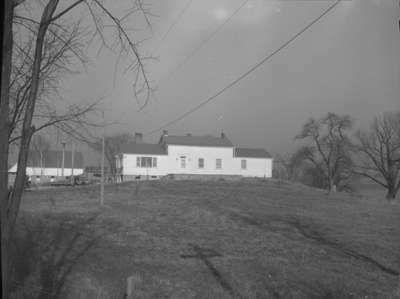 Black and white photograph of W.C. Thompson house and barn in Pickering. In the photo there is a pickup truck which says Alloway (or Alloway?) Farms Pickering Ontario. W.C. Thompson House and Farm, 1948, Marjorie Ruddy. Whitby Archives A2013_040_1125.